Why is the RCMP shuffling deck chairs, when the Titanic is sinking? Handgun homicides have increased dramatically since the 1990s. Handgun homicides spiked in the early 1990s and have continued to increase ever since. There was a shocking 46% increase in handgun homicides between 1974 and 2015. The increase in handgun homicides is due to a growing problem with criminal gangs. You can see the growth in Chart 5. The jump in handgun homicides has been masked by the continuous slide in homicides involving long guns since 1974, falling by 79% over the 40-year period. Demography drives this decline, not gun laws. Despite increasing gang murders, firearm homicides fell even faster than overall homicides since 1974. Firearm homicides have dropped from an average of 258 per year during the 1970s to 162 per year since 2010. That’s a 37% decrease. Pretty impressive! It is important to put firearms violence in perspective: only a small proportion (2%) of police-reported violent crime involves firearms. About 17% of violent crime involved another type of weapon, such as a knife or blunt instrument. These proportions have remained consistent for almost a decade. 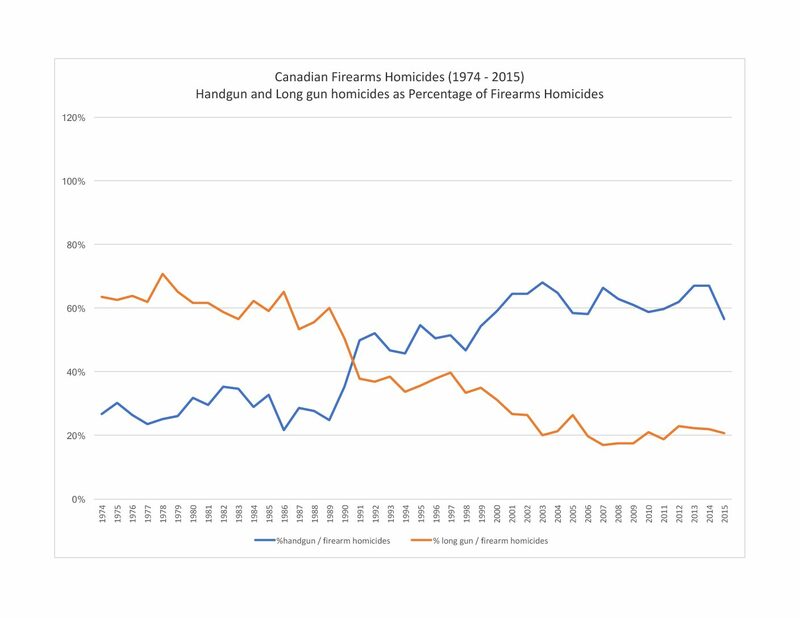 The Canadian homicide rate has plummeted from 2.8 per 100,000 population in the late 1970s to 1.6 per 100,000 since 2010; a 43% drop. This happened despite the slow decline in homicide victims since 1974. On average, there were 668 homicide victims each year in the 1970s (1974-1979); and just 557 victims per year since 2010. That’s a 16% decrease in victims. Not quite as dramatic as a 43% plunge in homicide rates. This impressive drop in homicide rate is almost entirely due to a huge increase in population: since the 1970s, Canada’s population ballooned by 57% — from 22.8 million in 1974 to 35.8 million in 2015. In comparison, the United States grew almost as fast, with a 50% increase in population (from 213.9 million in 1974 to 320.9 million in 2015). And their homicide rate fell even faster than Canada’s (50% vs. 43%). At the same time, stabbing homicides doubled from 16% of all homicides in 1974 (93 victims) to 35% of homicides in 2015 (178 victims). In 2015, police reported 98 gang-related homicides, up 16 from the previous year. The rate increased by 18% to 0.27 per 100,000 population (from 0.23 in 2014). In 2012, three-quarters (75%) of gang-related homicides involving firearms were committed with the use of a handgun (See chart 9). In 2015, 44% of firearm-related homicides were also related to gang activity, which has long been the case. Previous research has found that the presence of firearms is a significant factor in the likelihood of a homicide remaining unsolved. In 2012, over three-quarters (78%) of unsolved firearm-related homicides were gang-related. So why does the RCMP focus on peaceable firearms owners? Do they really believe tightening up regulations will stem gangland violence? Or perhaps they’re just trying to confuse the public who fear guns and who can’t tell criminals from sport shooters? The problem is drug smuggling — in Toronto or BC — not lapsed PAL holders. But the RCMP goes for headlines rather than effectiveness. 11 Comments on "Faced with gang killings, the RCMP blames PAL holders?" North Dakota and Minnesota (both with concealed carry) have lower murder rates than Manitoba. In fact, 23 states have lower murder rates than Mnaitoba. According to this article, even New hampshire with practically no gun laws has a lower murder rate than Quebec. Good point. Gun control does not control crime. All gun control does is build more powerful government and police bureaucracies. We need to shrink government. Thanks for getting involved. I urge you to join the organizations that will fight to toss the Trudeau Liberals out of Ottawa. Gary, It’s quite surprising to see people’s reactions when I ask them where do feel safer, walking the streets of Winnipeg or the streets of Fargo or Grand Forks North Dakota? They invariably answer Fargo or Grand Forks. Then I lay the shocker on them that both Minn. and N.D. have a lower murder rate than Manitoba even though they are allowed to carry concealed handguns. According to the anti-gun lobby, it should be the OK Corral down there. It isn’t. More people have to be told about this. Maybe the reason Minn. and N. Dakota have a lower murder rate is that rich Nordic farmers have no reason to kill each other, while gangs protecting their drug territory do. Focus your time and money on doing something about the the stupid “War on Drugs which has cost trillions of dollars and cost countless number of lives. Focus on gang intervention programs or reducing poverty. Remember the long gun registry? How many billions of dollars were wasted on that instead of being used for keeping kids out of gangs? The one universal human law is the law of Supply and Demand. If there is a demand for guns, there will be a supply no matter what the laws or restrictions. Take away the demand and you will take away the supply. I’m not doubting that overall the US has a much higher murder rate than Canada. What I’m disputing is that gun laws (beyond a certain point) have little to do with it. No one has explained to me why I’m safer in N.Dakota or Minn. where people are allowed to carried concealed handguns than I am in Manitoba which has extremely strict gun laws. I’ve looked at crime stats in the US states (and around the world) and I see states with more restrictive laws and lower rates and ones with looser laws and lower rates and also the exact opposite. This just leads me to believe that gun laws are just one factor, and probably not the most important one. Racism, poverty, social safety nets (like we have in Canada), access to mental health services, etc. are much more important. So why are we spending so much time and money on demonizing an inanimate object when we could be spending it on more useful endeavours like keeping kids out of gangs? Because it’s easier to go after the inanimate object and law-abiding gun owners. A good case in point . Quebec proudly has one of the lowest murder rates in the world, but so does it’s neighbour New Hampshire where there are virtually no gun laws (they even have open carry). Now Quebec wants to re-visit the long gun registry boondogle which cost the Canadian taxpayer billions and accomplished nothing. I would think that there are better ways to spend the time and money instead of a “feel good” political exercise. The RCMP knows where the problem is, it’s just that “peaceable firearms owners” are an easier, more visible target. It just makes it seem, to the uneducated public, that they are doing something. It doesn’t matter to them that it doesn’t accomplish anything, but it shows they are doing something. I can remember when the RCMP was not only the pride of Canada but was known worldwide for their capabilities and their dedication to ‘always getting their man,’ and I am ashamed to see what I witness today disguised as that once deservedly proud police force. Having lived through the ‘changes’ as they crept into Force, I now see a collection of individuals hired, not for their dedication and pride, but a group of bullies, hired for their size and ability to manhandle those smaller and/or older and, therefore, vulnerable to brute force, rather than learned techniques of violence-free arrests. We witnessed the case in Vancouver which accurately fits the above comments. It has been questioned before, I am sure all the Firearms used in recent shootings, in Vancouver and Surrey are registered. A safe firearm is generally a registered firearm. I also object to the use of the word “weapons” when referring to a citizens firearm. A a frying pan is a weapon when used to cause injury. But you don’t call it that when you put it on the stove. I would refer every one to read all quotes and statements, attributed to Thomas Jefferson ,when he talked about government and Firearms control. He also spoke of Government losing control to big business. The RCMP wants PAL holder DISARMED because of the coming of MARTIAL LAW. They want it easy rounding up “Problem Makers”. Its conspiracy reality, do your research before you dismiss it. Hey (devout Canadian)I am in Toronto, what part of the country are you in. I have always had a fire arm with me when I went out camping or just a day trip. It was held proudly in the rear window of my truck and then the laws changed so you had to hide them from view . U.S. law does not allow us to carry our gun across the border without special written permission now so I feel slightly unsafe when camping in the US. The places in the US that I felt safest was with people using their 2nd amendment rights for open carry, in fact I would prefer to be beside open carry citizens than police from any country. One time I spoke with 2 young men (bikers) in Washington at a pullout and they both had open carry and large military knives on display and I felt quite secure around them and we had a good conversation about our stupid Canadian gun laws . They both said that they get some hassle from the cops, but there is nothing the cops can do so they move on. The one man told me that he stopped a purse snatching one time and never even drew his side arm, just put his hand on the grip and waited for the cops to show up. The liberals/left have always wanted to disarm us and will never quite trying. Are you being condescending or….? Why do you think all those illegals are coming in? Because they will make gun laws more lax? Oh wait, probably because things will be much more peaceful and we won’t have a reason to have swat everywhere like they pretty much do in Europe? Everyday we are being sold something, all these distractions from the ready to pop economy and getting a crashed economy 5 times over 2008 but they won’t enforce laws? Nobody notices anymore… But hey what do I know, right?